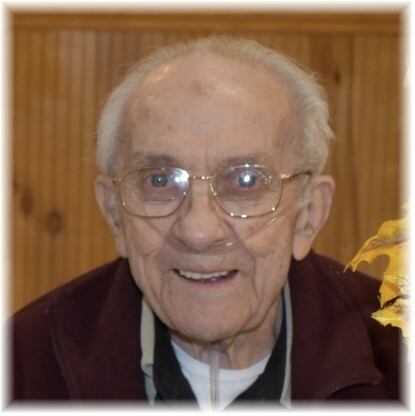 Obituary for John Draganac | Thompson-Marodi Funeral Home, Inc.
John Draganac, 91, of Belle Vernon, formerly of Trafford, died Saturday, April 13, 2019 at his home. He was born April 14, 1927, a son of Walter and Frances Gracson Draganac, in Trafford. He attended school in Trafford and retired as a conductor with Conrail after 33 years. Surviving are his wife, Betty McKeta Spina Draganac; two sons, Joe “Bean” Spina (Becky) and Eugene “Kutser” Spina (Traci); two daughters, Vickie Dalfonso (Anthony) and Regina Sicchitano (Ron Jr.); daughter-in-law Lori Spina; two sisters, Elizabeth “Libby” Zeravica and Frances “Shorty” Lisak; 16 grandchildren; 20 great-grandchildren; and three great-great-grandchildren. Deceased are a son Sam Spina; three sisters, Dorothy, Anne, and Mary; and four brothers, Joseph, George, Samuel, and Frank. Friends are welcome from 2 to 4 and 6 to 8 p.m. Tuesday at the Thompson-Marodi Funeral Home, 809 Main Street, Bentleyville, 724-239-2255, where a prayer service will be held at 9:30 a.m., Wednesday, April 17 followed at 10 a.m. by a Mass of Christian Burial at Saint Katharine Drexel, 126 Church Street, Bentleyville, with the Reverend Donald Chortos, Senior Parochial Vicar, as celebrant. Private interment in St. Joseph Catholic Cemetery, North Versailles.